INTRODUCTION: While most mild episodes of acute diverticulitis respond well to medical therapy, surgical treatment is indicated in the complicated forms of the disease with abscess and/or peritonitis. We evaluate our initial results of treatment of complicated acute diverticulitis by laparoscopic irrigation and drainage only with no colon resection. METHODS AND PROCEDURES : Three patients with acute sigmoid diverticulitis presented to us, one with diffuse peritonitis, and the other two with abscesses that could not be accessed percutaneously by an interventional radiologist. One was a pelvic abscess, and the other was interloop in nature. Both patients underwent a laparoscopic exploration, lysis of the inflammatory adhesions and phlegmon, irrigation and drainage. No clear colonic perforation could be identified in any of the patients. Estimated blood loss was minimal. Patients were kept on intravenous antibiotics then transitioned to oral antibiotics. Postoperative courses were unremarkable and average hospital stay was 4 days. There was no wound infection or recurrent intra-abdominal infection. One patient subsequently underwent uneventful elective laparoscopic sigmoid colectomy. 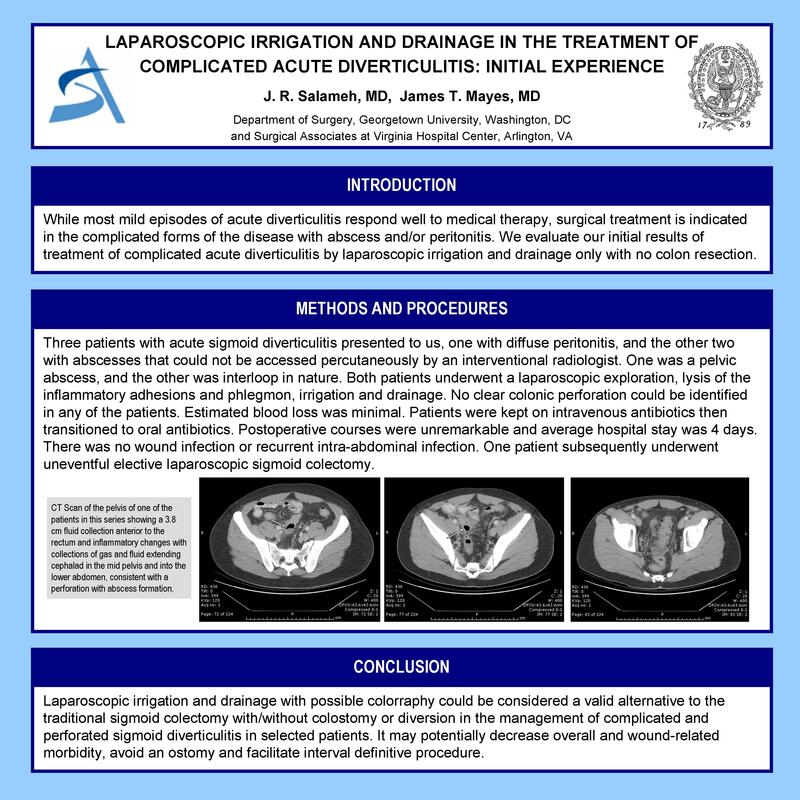 CONCLUSION: Laparoscopic irrigation and drainage with possible colorraphy could be considered a valid alternative to the traditional sigmoid colectomy with/without colostomy or diversion in the management of complicated and perforated sigmoid diverticulitis in selected patients. It may potentially decrease overall and wound-related morbidity, avoid an ostomy and facilitate interval definitive procedure.